Gambit 7 has been separated from Wits & Wagers based on game rule differences and at the request of the designer and publisher. Trivia for People Who Don't Know Stuff! 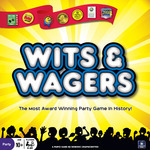 Wits & Wagers Game Show events are hosted by North Star Games at Origins and GenCon. These team events have gotten great buzz from Alan Moon, Tom Vasel, and hundreds of others.